At the Fox News Republican debate Thursday, host Megyn Kelly played a brutal highlight reel of Donald Trump making contradictory statements on foreign policy. "Mr. Trump, one of the things people love about you is they believe you tell it like it is," Kelly told Trump. "But time and time again in this campaign, you have actually told the voters one thing, only to reverse yourself in weeks or sometimes days." Fox then showed clips of Trump speaking about the war in Afghanistan, the refugee crisis, and former President George W. Bush's decision to go to war in Iraq. In the first clip, Trump was asked about whether American boots should stay on the ground in Afghanistan. "We made a terrible mistake getting involved there in the first place," Trump said in the clip. "That thing will collapse in about two seconds after they leave, just as I said that Iraq was going to collapse after we leave." The clip went on to play a subsequent interview in which Trump was confronted with his Afghanistan comments. Trump claimed that he "never said that." In the next part of the highlight reel, Trump took seemingly opposing positions on accepting refugees fleeing the civil war in Syria. And in the third example of Trump flip-flops, Kelly showed Trump declaring that Bush "lied" to get the US into the Iraq War, only to later equivocate on the subject. "And there are many other examples," Kelly said after the clips finished airing. "So how is any of this 'telling it like it is?'" Trump first addressed the Afghanistan question, saying he misspoke. "I did mean Iraq," he told Kelly, going on to explain at length his opposition to the US invasion of Iraq in 2003, which has been questioned by recent news reports. Trump then addressed the question of accepting Syrian refugees in the US. In the clips, Trump had seemingly evolved to a firmer stance against refugee placement in the US over the course of a day. "First time the question had been put to me, it was very early on, the migration had just started, and I had heard that the number was a very, very small number," Trump said. "By the second day, two or three days later, I heard the number was going to be thousands and thousands of people." Trump then talked about the need to build a safe zone so refugees could stay in their own country. "When I first heard the question" about whether the US should accept Syrian refugees, "the migration had just started," Trump said. "I was very much like, OK, by the time I went back and studied it ... I changed my tune, and I don't think there's anything wrong with that." Kelly didn't let up, noting that some might question whether Trump has a "strong core" if he reverses his positions so often and so quickly. 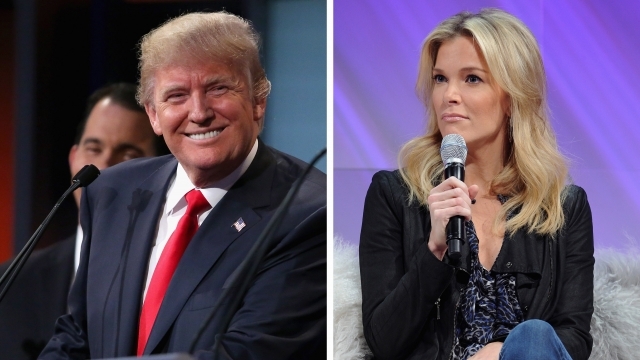 "Megyn, I have a very strong core," Trump said. "But I've never seen a successful person who wasn't flexible, who didn't have a certain degree of flexibility." Ohio Gov. John Kasich joined in the debate, saying that "the reason why people are so upset in this country is because politicians all the time tell them what they want to hear ... and they don't deliver on those promises." Florida Sen. Marco Rubio, who sparred with Trump all night, piled on. "There is a difference between flexibility and telling people whatever you think you need to say to get them to do what they want you to do," he said.